Bike-share bikes in Hallstatt, Austria. 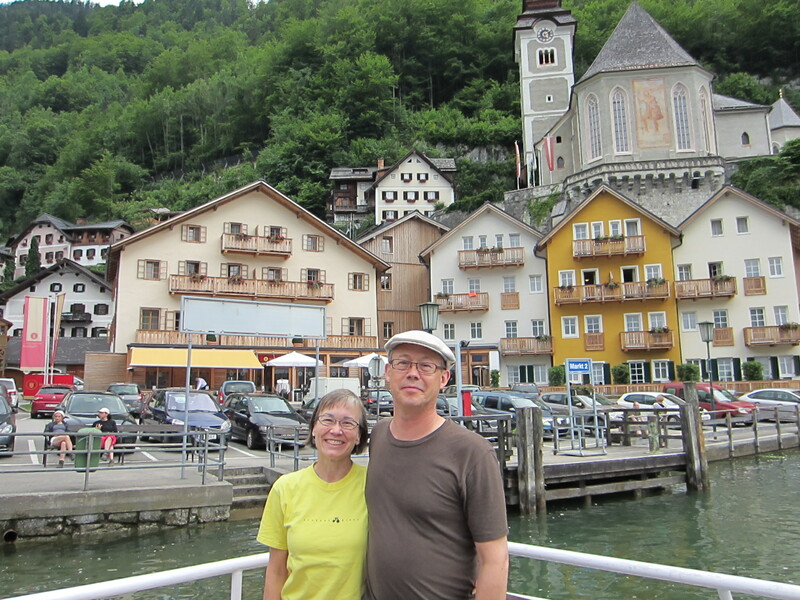 On my recent trip to Europe, my husband, Steve, and I spent a weekend in the gorgeous town of Hallstatt, Austria. Betsy and Steve in scenic Hallstatt, Austria, in a view from the ferry boat. This tiny lake town is over two thousand years old and is the home of the oldest known salt mine, hillsides full of darling buildings, and breathtaking mountains. It is only reachable by a ferry that appears just minutes after each train arrives. After biking in busy Vienna days before, I wanted to ride in this quaint town. While researching the area, I found there were no bike rental companies; however, some hotels there have loaner bikes, so I chose the comfortable, welcoming Hotel Gruner Anger that had six bikes available, each equipped with locks and racks or baskets. The town of Hallstatt is packed with tourists, so we jumped on the bikes and found the trail that led us away from town and around the lake. Reminiscent of Lake Louise in the Canadian Rockies, the lake is clear and the mountains rise directly above. The bike path is new, smooth, and away from traffic. We rode past public beaches, hotels, and forests. We rode approximately ten miles and came to the train station across the lake from the town. The trail isn’t finished much beyond the train station, so we stopped there and put the bikes on the ferry to return to the town. 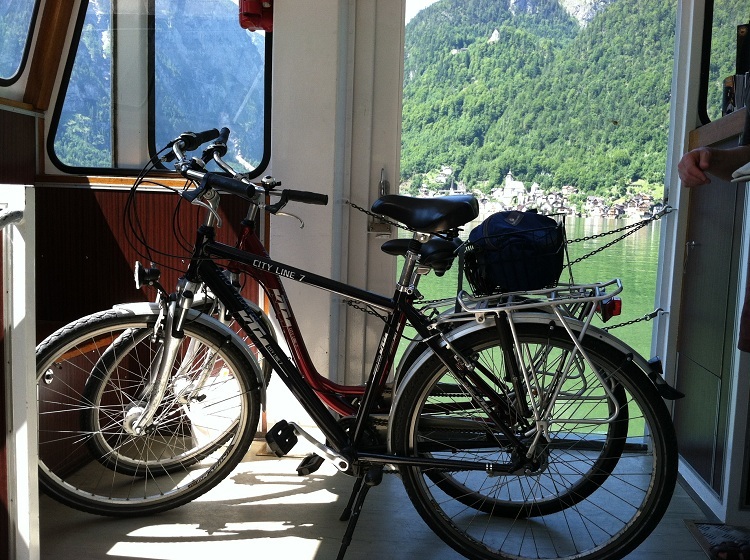 The ferry costs 2.50 euro per person and an additional 2.50 per bike. However,when I offered the money to the kind boat captain, he said, “I do not see the bikes,” so we only had to pay our own fare. After the ten-minute ferry ride, we took the bikes off the boat and rode through town while attempting to avoid hitting the countless tourists and returned to our hotel. 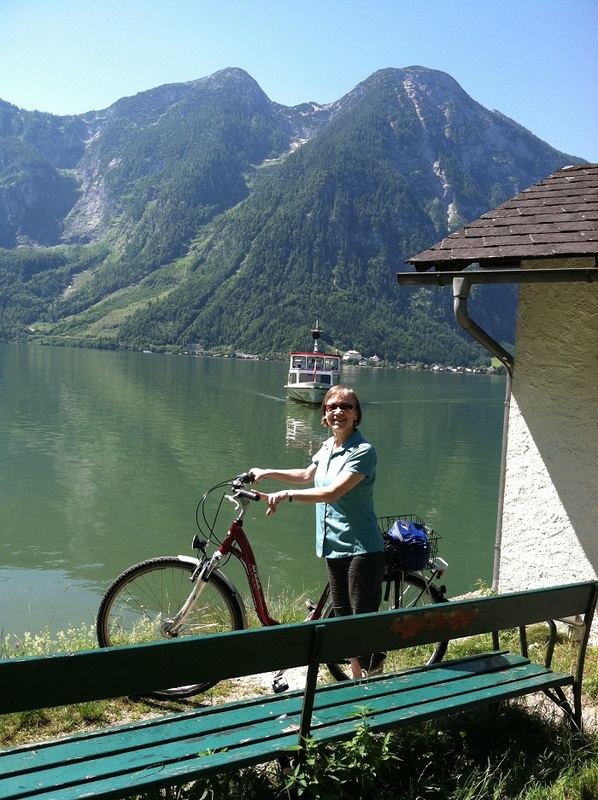 Betsy Lawrence at the lake–in Hallstatt, Austria. Hallstatt is a perfect refuge between immense Vienna and touristy Salzburg. While one can easily walk around the town and see all the sights, for clean air and gorgeous views, biking around the lake makes for a relaxing day.